The nuclear industry is having a renaissance. People are realizing that renewable energy sources like wind and solar cannot provide customers with energy 24 hours a day, 365 days a year. Environmentalists have been so persuasive in promoting renewables, that we have even legislated power companies to development them only to realize that power companies have to build fossil fuel plants to provide power when there is no sun and/or wind. At the moment, there are only three large nuclear power reactors that are licensed by United State Nuclear Regulatory Agency (U.S.NRC or NRC) to be built and operated in the United States. The first is the Westinghouse AP1000, a Pressurized Water Reactor (PWR). Westinghouse has two units under construction in South Carolina and two in Georgia as well as four under construction in China. The second design is GE’s latest version of its decades old line of Boiling Water Reactors, the ABWR. GE also has a Certification Renewal pending for the ABWR, but this is to facility their existing customers’ license extensions. Likewise, for Toshiba’s pending ABWR Renewal. The third is GE’s latest design, the Economic Simplified Boiling Water Reactor (ESBWR) which just received its Final Design Approval from the NRC on October 15, 2014. It took both companies over nine years from their initial Design Certification Application (DCA) to achieve final NRC approval. Each company has been the champion for their particular reactor type for decades. Is one better than another, we don’t know. These two links, PWR and BWR, link to NRC animations explaining the basics of each design. If you want to learn more, these Wikipedia articles seem factually unbiased, however they are technical and lengthy. (Wiki-PWR) (Wiki-BWR) Additional material about reactor designs is available in our Education section. The U.S. Nuclear Regulatory Commission’s page on Design Certification Applications for New Reactors list several other approved or pending designs. The Westinghouse System 80+ is no longer marketed. Westinghouse’s AP600 was fully approved in September of 1998. It was developed in response to the perceived desire for smaller power plants, but it received no orders. So Westinghouse engineers scaled up the plant to 1,000 MW and sold eight AP1000s. The AP1000 received it first Design Certification in 2006. Since then the Certification has gone through several revisions with the current AP1000 being certified in December of 2011.Two other large reactors are in the process of certification. Both ARIVA (French) and Mitsubishi (Japanese) have applications to license their designs in the United States. If and when approved we should evaluate them to see if they are better products. To stay alive after the US stopped reactor construction in the 1980s, both companies had to joined with Japanese firms to build in Japan and elsewhere around the world. GE became GE-Hitachi Nuclear and Toshiba bought into Westinghouse and now own 87% of it. Their marking efforts seem directed toward China where the have started construction on 4 AP1000s. China is working with Westinghouse-Toshiba to develop larger versions of the AP1000 (the AP1400 & AP1600 of which China will have full ownership of intellectual rights) to fulfill their desire of the to build 400 nuclear plants by 2040. Our selection process may be simplified by reviewing the six-year evaluation process used by Dominion Virginia Power to select the GE Hitachi’s ESBWR for its proposed North Anna Unit 3 plant. GE Hitachi has teamed with Fluor, a global construction company, as a consortium for the North Anna Unit 3 project. More on Dominion’s April 25, 2013 Announcement. 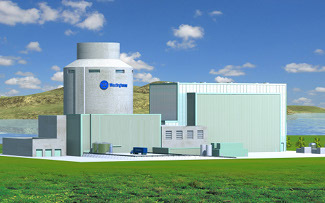 Dominion Virginia Power selected GE Hitachi’s ESBWR reactor technology based on the progress made by GE Hitachi towards obtaining federal approval of its design and because the contract enhancements agreed to are expected to benefit customers and stakeholders over the planned 60-year life of the new unit in comparison to other technologies evaluated. (We read this to mean that the cost per kilowatt for a GE ESBWR is less than that of Westinghouse’s AP1000. ENW) If constructed, the GE-Hitachi ESBWR unit would provide the North Anna Power Station with an additional 1,470 net megawatts of nuclear-generated electricity. It also offers a simpler design in comparison to other technologies, including passive gravity-based safety features – water stored above the reactor that would flow to the reactor by gravity in the unlikely event of a significant nuclear accident and circulate naturally to maintain cooling of the nuclear fuel. One design not listed is the latest Canadian CANDU heavy water reactor. Personally we think that we should sponsor its approval in the United States. China is working with Candu on several projects around the world. If the United States does not overcome its political motivated, myopia view of nuclear power, by the time our foggy vision clears, we will be buying all our nuclear plants from China. The above reactors are “Real Reactors,” designs that have been licenced and/or constructed in the United States, Canada, France, Japan, or China. Before we go on, we should contemplate these wise words from U. S, Navy Admiral Hyman G. Rickover, who was known as the “Father of the Nuclear Navy”. “It is incumbent on those in high places to make wise decisions and it is reasonable and important that the public be correctly informed. “An academic (paper) reactor or reactor plant almost always has the following basic characteristics: (1) It is simple. (2) It is small. (3) It is cheap. (4) It is light. (5) It can be built very quickly. (6) It is very flexible in purpose. (7) Very little development will be required. It will use off-the-shelf components. (8) The reactor is in the study phase. It is not being built now. We are giving the GE-Hitachi PRISM a page of its own as we believe is the best, most developed Generation IV design and it should be promoted as part of Energize Northwest’s effort to reduce global warming emissions. The PRISM is unique in that it can use the spent fuel from our present light water reactors as fuel and burn up the extremely radioactive transuranics they contain. This has resulted in the media describing the PRISM as the reactor that “eats” nuclear waste. Smaller nuclear power reactor designs are discussed on our Small Modular Reactors page.